I have two unfinished quilts from craft camp but they are both requiring some careful thought - about sashing and colours and design - and I was in the mood for something quick and easy and stash busting. 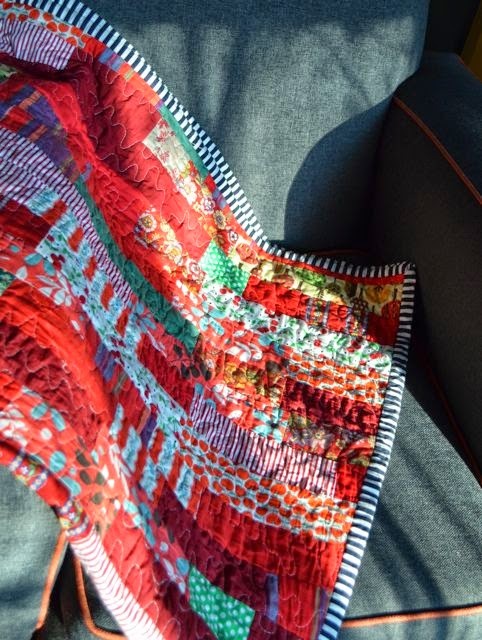 Another strip quilt was an easy way to scratch that itch and I do have plenty of red fabrics. 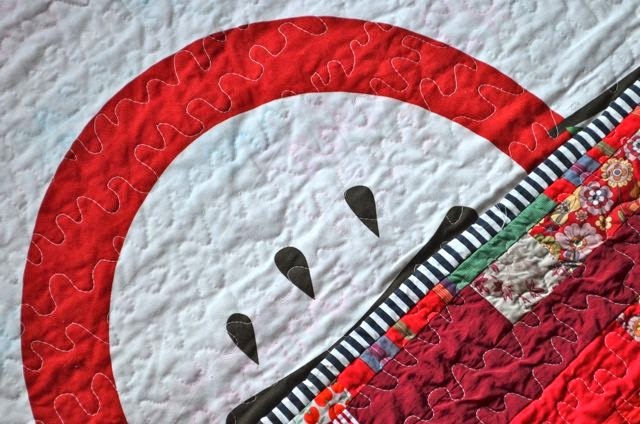 So this apple-red-with-dashes-of-green quilt was made. 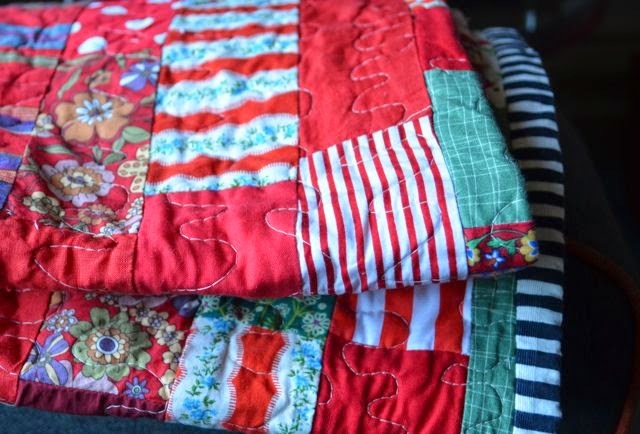 Last movie night, there had been an insufficient number of lap quilts to accommodate the requests of each child for something to snuggle under and I love an excuse for a new quilt. 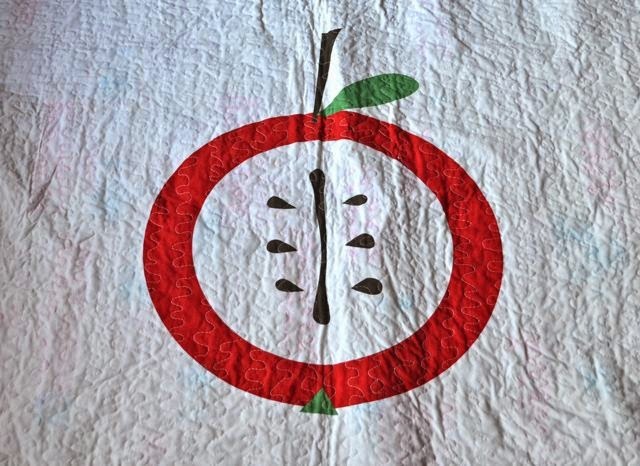 And I was also pleased because I had found this apple fabric at Ikea and thought it would make a great quilt backing. But then all my slack-arsed-instant-gratification-quilting chickens came home to roost. Because I hadn't pre-washed my fabrics, (I never do) and when I popped it in the machine to get that nice bobbly quilty look, disaster struck. Or perhaps more appropriately disaster ran. Included amongst the scraps I used were a red and blue madras (which I should have predicted would run), and a beautiful and very expensive bit of red linen (which I was quite shocked ran). These culprits ran all over the lovely fresh whiteness on the backing, quite destroying the crisp apple effect. Just to show you how bad it looks I upped the contrast on the photo editing. 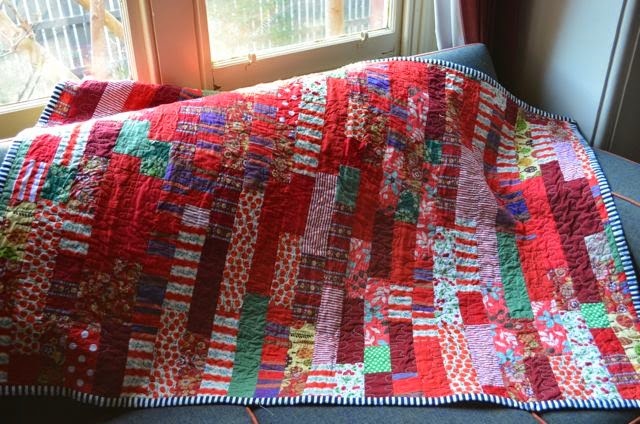 The colour ran all around the quilting within each strip of fabric. I have been told that there is a colour-run remover on the market and online I've read recommendations for oxygen-based bleaches, vinegar and various other remedies. I'll try whatever I can, and if nothing works, it's still a nice quilt top, and perfectly good for snuggling under. 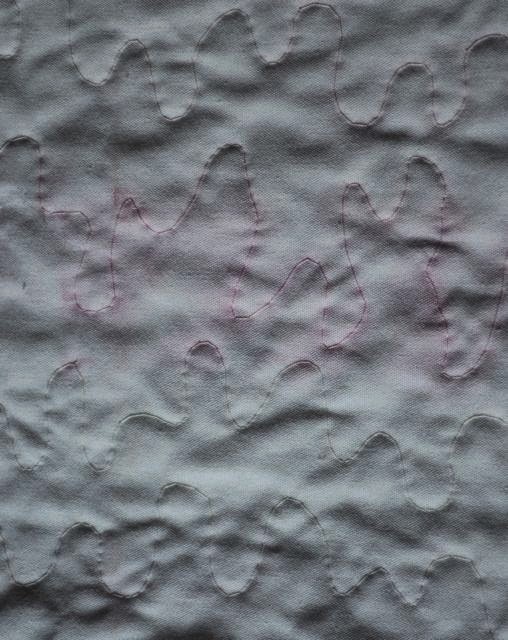 And I suppose it's also a good reminder about cutting corners, though to be honest I doubt I'll always pre-wash fabrics from now on - maybe just red linen and fabric of unknown provenance. Labels: quilts, reusing old stuff, sewing, things I've learned. Oh and I SHOULD SAY that is a lovely quilt. Perfect for couches and snuggling. Did my other comment not post? I will write it again at the risk of sounding redundant. I have used the colour run fixer thingo they sell in the supermarket and it worked great! Not 100% but you wouldn't notice any colour run unless you were peering closely at the fabric, questioning your life choices. Hypothetically. I also hear they make one you put in the machine at the same time as the thing you suspect will run. Then it catches any extra dye for you. Perhaps an alternative to prewashing? I haven't used it myself but I hear good things. thank you so much - good to have some first hand experience. 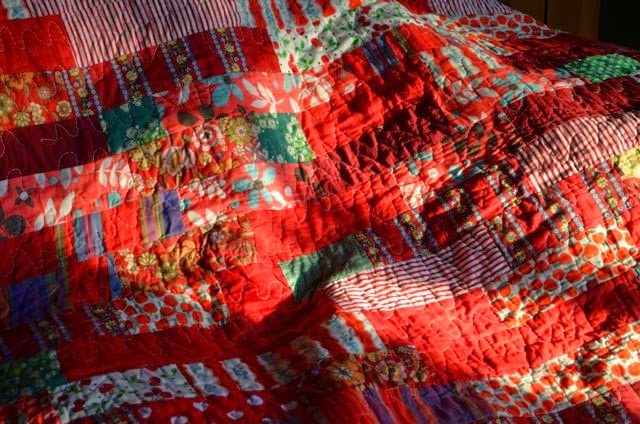 I have a bad feeling I used that same red linen in another quilt I've yet to wash. Do you think I should just put the dye-run stuff in with the wash first time I wash it? I would do that, probably. I think there are two different products - a dye collection for not-yet-run colours, and a dye fixer thingo for stuff that's already run. I am not sure what the difference is, tbh. My not very good supermarket has them both in the laundry aisle, and I don't think they're that expensive, although it's all relative I suppose.